Tart cherry juice is all the rage this year! Exotic super fruit juices (acai berry, mangosteen) are losing ground to local fruits and berries. I’m delighted with this trend and excited to try some of the new juice beverages in the fresh produce section. 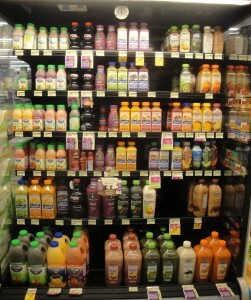 One of these juice products is Cheribundi’s Ginger Cherry juice. The cherry juice in this beverage is advertised as coming from 50 cherries and not from concentrate. There is no added water on the ingredient statement, and the ingredient statement reads (in descending order): tart cherry juice, apple juice (from concentrate), ginger juice and natural flavors. Cherry ginger is a new flavor combination. There exists one other beverage: a cherry ginger soda from Reed and several recipes for chutney, scones and cocktails with the same combination. Honestly, the cherry ginger combination didn’t appeal to me much, but I am always interested in trying new food and beverage products. Pleasantly, I found this flavor combination to be very delicious. The ginger flavor and aroma was strong and the profile was like a fresh pickled pink ginger slice you get in a sushi restaurant. Cheribundi Ginger Cherry juice was tingly, but without carbonation. The ginger adds a nice lightly hot and tingly sensation. Quickly, the ginger dissipates and the beverage turns to a nice fresh juicy tart cherry flavor. Cheribundi is very refreshing and easy to drink. I would highly recommend trying this juice beverage. I’m impressed. The flavors of ginger & cherry and tastes of sweet & tart are perfectly balanced in this beverage. Nutritionally, the Cheribundi doesn’t claim any “super” affects, but it sure tastes good. The Cheribundi website http://www.cheribundi.com/ indicates that their cherry juice is processed to maintain a high level of phytonutrients. I feel good both keeping up with the trends and drinking something healthy. I reebmmer cherry lips! They were always really hard to chew if I reebmmer correctly, a bit like those little floral ones that tasted like soap.I would love to try this cherry drink David because I love cherries and ginger what a fantastic combination.